Designer Plazzo Suits have become the most preferred attire for weddings and other events like parties and family functions. Best to wear in day to day life, these salwar suits make you stand out from rest of the crowd. Traditional yet trendy in look.These suits are very comfortable and gives attractive look for any occasion. 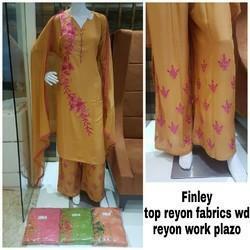 As a quality-oriented organization, we are focused to provide our clients excellent quality Cotton Printed Suit. The entire range of suit is designed by using advanced knitting techniques and quality tested fabric. This suit is checked by our quality auditors to deliver fault free product. According to the taste of clients, we offer entire range of suit in varied prints and attractive patterns. Our Unstitched Fashion Suits Are Very Versatile And Elegant.these Are Cotton Based And Are Available In Different Sizes In Market.these Unstitched Fashion Suits Designs Are Available In Different Colours And Sizes In Market And Are Also Very Comfortable.these Makes You Feel Special In Any Special Occasion Or Function.these Unstitched Fashion Suits Are Stylish And Elegant In Look. Printed Plazzo Suits offered come decorated with sparkling work done on the fabric that makes these salwar suits look and feel gorgeous. As highly desired outfit choices, they perfectly match up with the dressing choices to ladies. Some of its features include available in new trendy finish; beautiful and vibrant finish; provide a best matching fit; designer appearance; quality finish enhances the good looks of wearers. Latest Punjabi Suits offered provide a light and classy finish appeal. Coming developed using quality fabrics, these salwar suits also feature smooth texture and quality finish. Some of its features include latest style choices to pick from; array of work choices on the fabric which makes them highly desired to wear during social gatherings; provide perfect touch of style and grace; lightweight finish for comfortable wear value; choice of other finish and design styles to pick from. Ladies Plazzo Suit offered comes in quality fabric finish and come beautifully designed in quality fabric that adds an exclusive and attractive presentation finish to these salwar suits. Adding charm to the dressing sense of wearers, these salwar suit choices make for exciting fashion statement and are perfect wear choice for fashion conscious ladies. Some of its features include lightweight finish; beautiful mix of colors that provides for distinguished dressed appeal; use of soft fabric which makes these provide absolute wear comfort; fine detailing work and breath taking finish. Designer Salwar Kameez offered are in line with latest emerging fashion trends and come with exclusive finish work and printed designs which makes these highly desired by the customers. Further, its exclusive finish makes wearers look gorgeous. Some of its features include exciting embellishment; lending a contemporary touch to dressing appearance of ladies; perfect to be worn on all important occasions; vibrant color shades; available to customers at reasonable rates. With the valuable assistance of skilled team of professionals, we are engaged in offering an extensive range of high-quality Indian Trendy palazzo Suit. As highly desired outfit choices, ladies suits perfectly match up with the dressing choices to ladies. Some of its features include available in new trendy finish, beautiful and vibrant finish, provide a best matching fit, designer appearance, quality finish enhances the good looks of wearers.